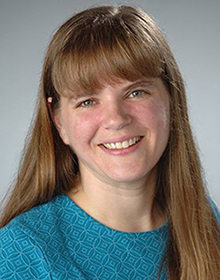 Sarah Hamersma, associate professor of public administration and international affairs in the Maxwell School, is the 2015 recipient of the Birkhead-Burkhead Teaching Excellence Award and Professorship. Her selection was announced at the Department of Public Administration and International Affairs (PAIA) convocation on June 26. The Birkhead-Burkhead Award and Professorship is given annually to recognize outstanding teaching in PAIA. The selection is made by a committee comprised of former award winners, and is based on nominations by current students in the department. Honorees hold the professorship for four years and offer the faculty address at the PAIA convocation in the year following their selection. The award is named to honor two former Maxwell School professors who taught in PAIA. Guthrie Birkhead was a member of the faculty from 1950 until his death in 2013, with an appointment in PAIA and political science. He was dean of the Maxwell School from 1977 until 1988 and had also served as director of the Metropolitan Studies Program (now part of Maxwell’s Center for Policy Research). Jesse Burkhead served on the Maxwell economics faculty from 1949 until his death in 1996; he retired as Maxwell Professor of Economics. His contribution to PAIA was as an expert on public budgeting. His 1956 book “Government Budgeting” was widely acclaimed.